Fantazia has grown from strength to strength within the display field, having clients all over the globe. Our teams have collectively over 300 years of experience and it is this experience that gives Fantazia the edge. Our innovative staff have an extreme and diverse range of knowledge in all aspects of show production whether fired from land, water, rooftops or indoors. We can create virtually any effect you require, from walls of fire to explosions of confetti and sparks indoors, through to our firework displays that have stunned and amazed crowds time and time again. 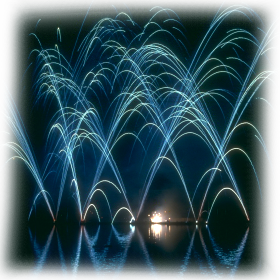 Our long standing relationship as direct importers with manufacturers both in the Orient and in Europe means we can guarantee the best quality fireworks and effects at the best possible price. As members of both the British Pyrotechnics Association and the Explosives Industry Group, our safety record is impeccable. This track record is maintained by ensuring that our operating and training procedures go above and beyond the letter of the law. We have full annual public & product liability insurance of £10 million, which can be extended if required, giving you complete peace of mind. From the first point of contact we aim to make life as easy as possible for you, the client, we guide you through every stage of the process to ensure that with minimum effort on your part, the end result is one that will be talked about for years to come.